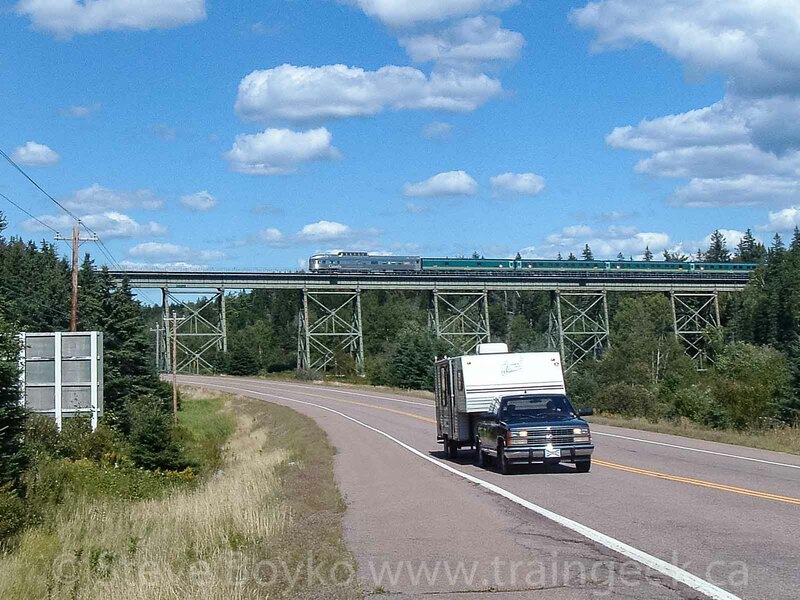 Bruce Hollett posted a photo on NERAILS of VIA 15 at Windsor Junction at 13:10. This was the same train we saw yesterday. 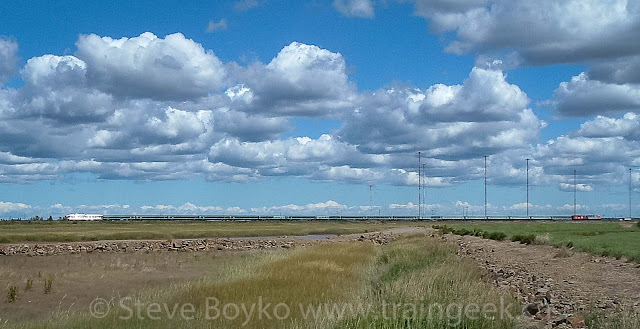 We were crossing the Tantramar Marshes between Sackville and Amherst while Bruce was taking this photo. A motley group of railfans set out to chase VIA 14 and VIA 15 this sunny Friday. David Morris, Peter Gough, my son Nick and I left Fredericton to get VIA 14 at Rogersville and pursue it deep into Nova Scotia. We thought we had plenty of time to get to Rogersville... we were wrong. A little pressure on the gas pedal brought us to the station, where we found the sign out indicating a stop was requested. We went just up the line from the station, and there was the train approaching. 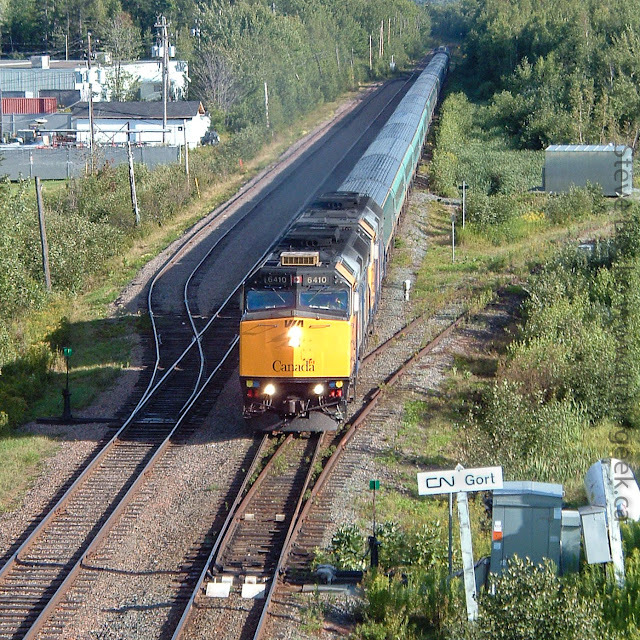 The train was VIA 6428 and CBC unit 6403 leading 19 Renaissance cars and Evangeline Park. We set up on the south side of the station to wait for 14's departure at 10:43. VIA 6403 in second position on VIA's "Ocean"
From there we chased it down the highway but never caught up to it. A few fleeting glimpses of the Park car in the distance were all we got. After refueling at McD's we proceeded to Memramcook to David's favourite barn location. 14 trundled into view at 12:36. I did some very bad panning with my video camera here. One example of why trying to take a couple of stills while videotaping is not a great idea. We caught up to it as it entered Sackville, so we went to the other end of the station to catch it crossing the bridge to the Tantramar marshes at 13:05. I like how the sun caught the Park car here. The RTC told 14 he would meet the CN local at Amherst. We figured we might catch 14 leaving Amherst, and so we did at 13:25 as it crossed under the Trans-Canada Highway. The group consensus on the next shot was to get it at Folly Lake. David wanted to shoot it at the lake itself, and Peter and I wanted to get it on the East Mines trestle. 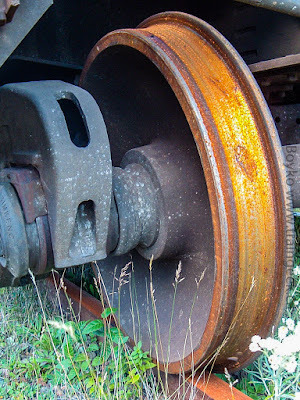 We dropped David and my son at the siding and went the 11 km or so farther to the trestle. We set up and waited. We weren't sure what kind of warning we would get, and sure enough we had absolutely no warning before 14 rushed across the trestle. I quickly hit "record" on the video camera and caught the engines halfway across. That was the end of 14 for us. We went back to Folly Lake to rejoin David and Nick to wait for 15 to come back. We had heard on the scanner that they were meeting at Belmont as usual, so we knew it would be a little wait. We had some lunch. The cars in the siding have been there a while! VIA 15 appeared at 15:04. VIA 6410 and 6406 led 19 Ren cars and the Revelstoke Park. We beat it back to the Trans-Canada and headed toward Moncton. As we approached the Springhill exit we heard the Salt Springs hotbox chatter away, so we knew we were just behind the train. We decided we would get it at Aulac next. I parked across the tracks and we climbed the berm to wait. 15 arced gracefully through the curve at 16:15. Once again we got on the highway. As we approached Moncton we thought we might be ahead of 15, so we pulled off the TCH where the tracks go under the highway and waited. She showed up at 16:58. I included the latter one to show how the Park car towers over the Renaissance cars. Our last chance was on the other side of the Moncton station. We voted and decided to go to Gort. As we crossed over the tracks on Delong Drive we saw CFMG 6902 leading NBEC train 402 into the yard. 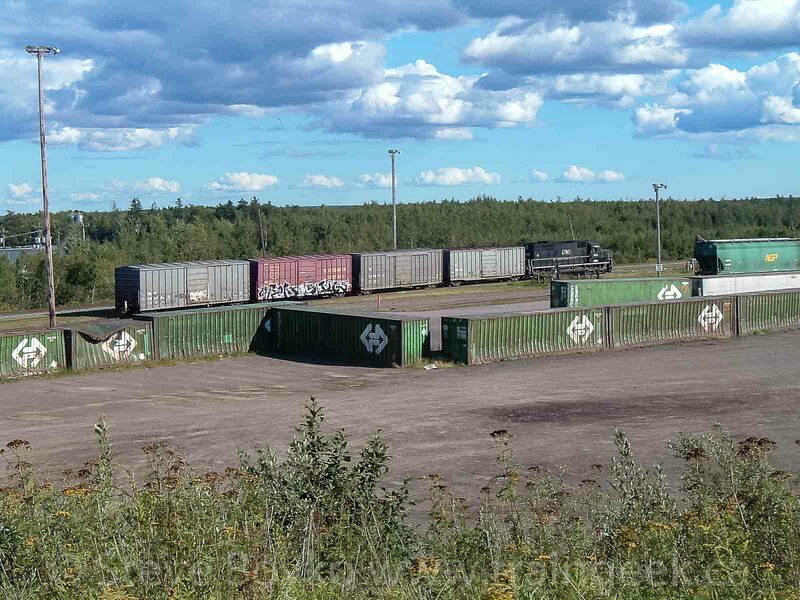 It had 4 boxcars in tow. A group of three CN engines rolled out toward the main line, then reversed and disappeared out of view. I believe one of them was CN 5737 but I can't be sure. VIA 15 appeared at 17:40 and rolled underneath us and away. I got my best still shot of the day here. And so ended a great railfanning day. Thanks to David, Peter and Nick for being such great company. PS - here's a photo of the same VIA 14 at Windsor Junction, by Bruce Hollett. I see IRSI is advertising in Railway Age now. The August 2006 issue has a classified ad from IRSI offering "Twenty-seven (27) Stainless Steel Budd RDC cars for sale." ... "Cars are available for sale as is, rebuilt in-kind, or as a custom engineered remanufacture to meet end-user specifications." No price is given, of course. Let's hope they get some interest! I had the good fortune to see both VIA 14 and 15 today in Moncton. My family went there to visit the Moncton Zoo for the first time. 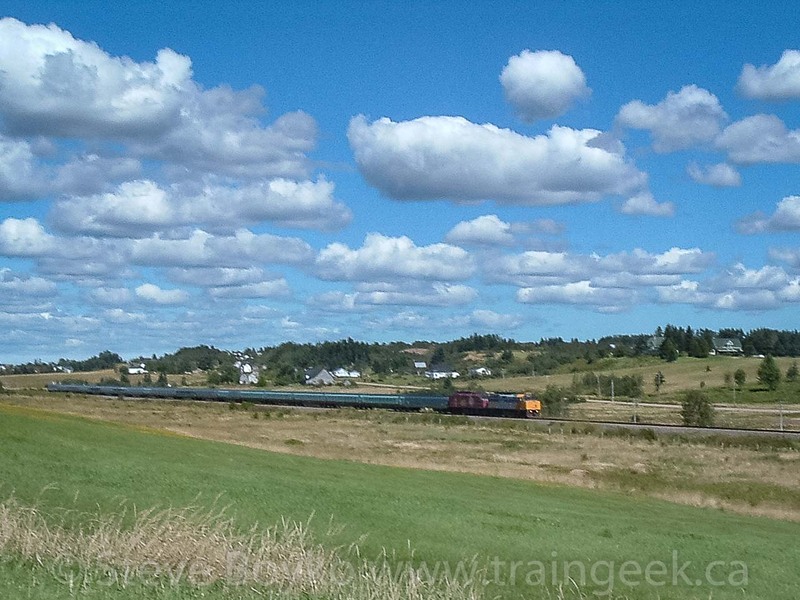 I timed our departure so we would arrive in Moncton around 11:45, and planned to have lunch at the Tim Horton's by the West End so I could watch 14 go by. As it happened 14 was late and only passed us at 12:23. 6413 and 6420 led 19 Renaissance cars and Assiniboine Park. I called VIA and found out that VIA 15 wasn't expected in until 17:20. We ate supper at Steve's Diner in Riverview, and as we walked to the van I figured the Ocean would be departing the station. I switched the scanner on, and sure enough someone was reporting that the main line switch was lined and locked for the normal position. They were en route! 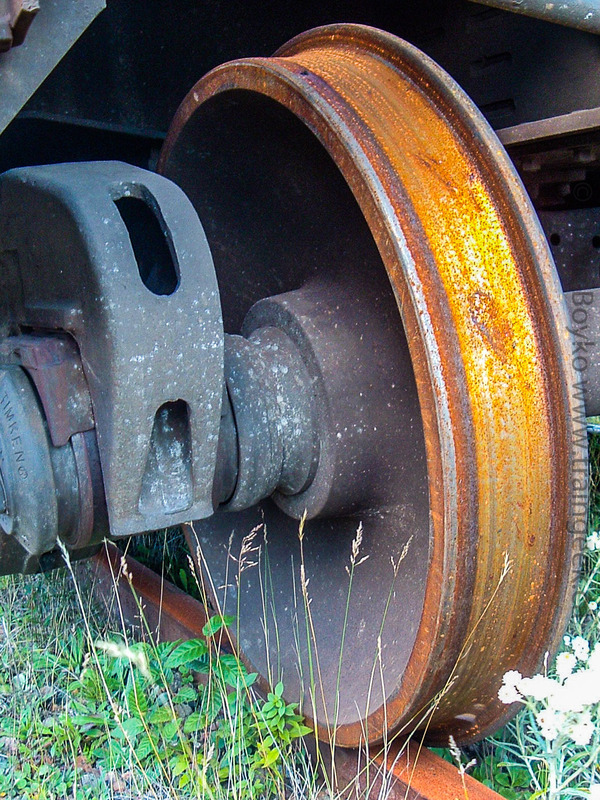 I drove across the causeway, and ran up the slope to the tracks while switching tapes in the video camera. I arrived with not a moment to spare at 17:52 as VIA 15 went by. 6428 and CBC unit 6403 led 18 Renaissance cars and Evangeline Park. 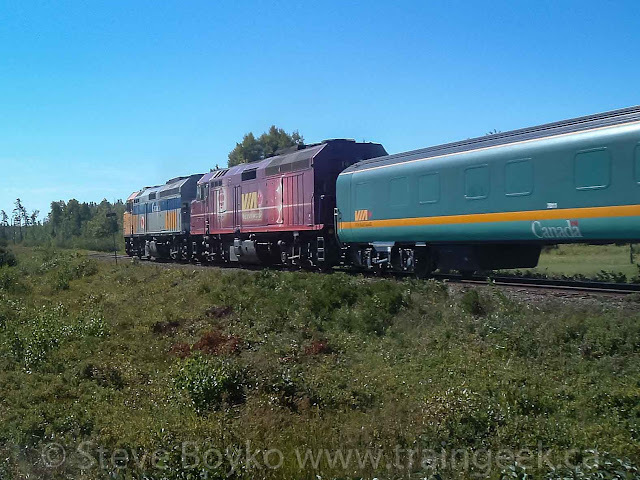 12:50 VIA 14 arrived in Moncton with VIA 6424 and 6420 leading 16 Budd cars. Banff Park was trailing. 17:04 VIA 15 arrived in Moncton with VIA 6427 and 6432 leading 14 Budd cars. I must have been volunteering at the New Brunswick Railway Museum to catch both of those. I would try to catch VIA 14, then go to Hillsborough for the 2 PM run, then get back to Moncton to catch VIA 15 before going home. Lou McIntyre was kind enough to pass along a photo of NB Southern 2318 in its new paint scheme. He caught it on July 1 at McAdam. Thanks for the photo, Lou! Contrast this with a shot of NBSR 9802 and you can see the similarities in the paint scheme. Keep in mind that even though they are both classified as GP38 engines, they come from very different origins. The 980x series come from Southern Pacific GP35s while the 231x series come from Devco GP38s. There are many differences between the two series, and these photos show that the ditch lights and bell locations are two of them.